Are we too busy watching the show that no one has stopped to ask the question of- how can we track down and hold accountable the crisis actors which are destroying freedom in America and around the world? It's a brand new narrative and it's something truth and freedom lovers will have to tackle at some point in the near future if humanity is to survive the coming catastrophes. The need for an investigative body that will penetrate the secrecy of government to hold crisis actors (among others) responsible for their crimes is urgent. So let me be (one of) the first to say it. Crisis actors are just as guilty as those in power, especially over the past two administrations, who are committing crimes against humanity, and they must all be held accountable. It is time to view crisis actors in this regard from now on. Now that we're living in an era of crisis actor guided staged events, it's time to start focusing on how we can deal with this problem. It's time to ask questions like- should we-the-people create a tribunal process to give proven and caught crisis actors a chance to defend themselves or face punishment? Can we make citizens arrests on these traitors? These are the questions we should be asking. All crisis actors are guilty of treason against the United States of America as they have engaged in deceit of the general public in return for convenient protection by the state for the purposes of enslaving the masses and promoting tyranny. Many of us have watched in horror as treasonous crisis actors have partaken in mass shooting drills that occasionally go live. They then engage in telling testimonies of staged events. They've been caught doing many things including: showing up at multiple staged events, offering impossible details often inconsistent with reality, offering overly focused detailed description of things with the sole intention of selling the eyewitness account, inappropriately laughing in moments we are led to believe they are supposed to be mourning tragic loses of close loved ones, stuttering inexplicably, reading their lines from prepared cards, magically describing what others are thinking, and for good measure these crisis actors will sometimes themselves go on live TV and call for more gun control in light of the new crisis. Sooner or later humanity as a whole will have to strip down the veneer of lies and deceit these crisis actors live behind. We have to first wrap our minds around the reality and the seriousness of their crimes. Realize that these crisis actors are the citizens of the new world order and they should all be subject to arrest. As traitors of our nation they've been offered a seat at the table by those who want to take away our freedoms, destroy nation states and establish their new world order. I believe the crisis actor phenomenon that we are seeing today caught humanity off guard when it started. We knew that some people lied on live TV about the event on 9/11/01 (think Harley guy), but back then we referred to them as conspirators and liars. The crisis actor phenomenon of today has taken a whole new level, look and feel. We saw on 9/11 how many people conveniently changed their story, in many cases years later just to match the official story. The lying phenomenon seems to have become deeply embedded into the conscious of humanity by Hollywood. Numerous TV shows over the past few years have focused on the concept of lying and have subliminally trivialized or made light of lying. Often lies are painted in a good way with respect to doing business. They call it marketing. Other times, the goal is to convey the idea that lying is normal. I believe all of these social engineering agendas have contributed in some way to today's crisis actor phenomenon. Crisis actors are now listed alongside others like- drone operators, chemtrails pilots, mercenary black ops groups (e.g. CIA, Blackwater) and members of western cabal proxy army groups (like ISIS). All of these are segments of humanity who have offered themselves up as tools of the new world order, partaking in crimes against humanity without any consequences whatsoever. These are people apparently hardened to humanity who have perhaps been mind-controlled, lured with money and power or have simply chosen to ignore their consciousness in order to commit acts of evil against humanity. Let's look for creative ways to bring this issue to the light. 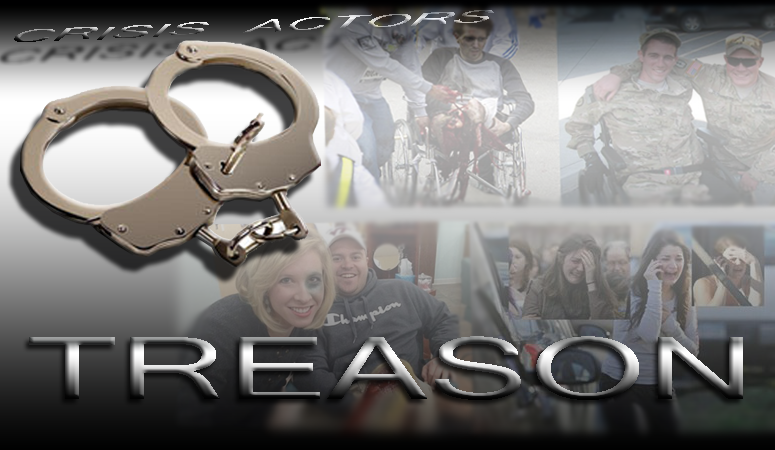 It's time to make a list of the false flag shootings of the last 7 years and start gathering all the evidence against these crisis actors in a manner that can be submitted in a court of law. The time is coming to find a way to hold these crisis actors accountable to humanity for what they've done. It's time to come together to share ideas and discuss the possibilities of this entire process becoming a reality. If you think this topic is an exaggeration of what is possible or if you think the idea of holding crisis actors accountable is not realistic enough then perhaps you haven't wrapped your head around the reality we are all facing and what is coming. Or perhaps you are suffering from learned helplessness and have conceded that crisis actors are untouchable. So far, all of the crisis actors have gotten away with participating in these staged events because they know they will never be prosecuted or punished by those hiring them. Isn't it time to brainstorm for ways to change this? What if we COULD change this? What would that change look like? It's time to put every solution on the table. If nothing else, this is how we need to be thinking moving forward. Remember, the globalist are moving forward and they are moving fast. Obama is promising to put gun control at the top of his list as his final year winds down in 2016. With a record 160+ mass shootings under the Obama presidency, can you imagine how bloody 2016 could potentially be? Can you imagine how many crisis actors they are preparing for these events? Are you beginning to get the picture? If so, then help share this message.